Primary school children love games, and there are plenty of apps and interactive software available that can be used to improve literacy skills by helping them to practice their grammar, spelling and sounding out phonics. With children being exposed to technology at an increasingly young age, it makes sense to embrace a tool that engages their interest and gets them excited about learning. You can bring gamification into the mix here too, but essentially camouflage learning is when the students learn through play and aren’t aware that they are actually being taught something from the curriculum. Our Promethean Advocate, Mr Hunt, has some great ideas on using technology to support camouflage learning in the classroom. In a nutshell, it’s making use of everyday technology and not necessarily educational software, to engage students in lesson delivery. For example, using Angry Birds to create and solve maths problems, or asking Siri questions to solve quiz questions. Learning how to write starts long before a child enters the classroom. When developing their fine motor skills as a toddler it’s actually fine tuning the skills needed to hold a pencil correctly. With our ActivPanel, pupils can improve their fine motor skills either by using their finger to write on the panel seamlessly, or by making use of the ActivPanel Pen, where they can also practice their grip. 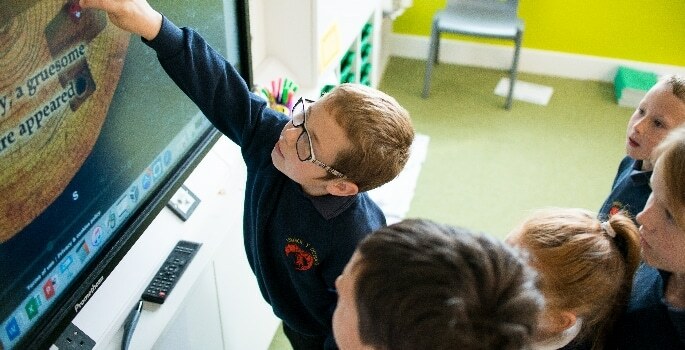 They can also share their work from the ActivPanel direct to their laptop, tablet or smartphone device thanks to screen mirroring, meaning they can continue practicing from their desks or in another area of the classroom. What better way to encourage students to be enthusiastic about reading and writing than providing them with an opportunity to write about something they love? A class blog could be kept internally within the school or shared with parents, but it provides students with an opportunity to really think about what they are writing and become enthusiastic about sharing their work (and progress) with peers and family. Collaborative learning provides students with a great opportunity to improve on their literacy skills by working together on projects, for example ‘verbs or nouns’ where students have to identify which is which. Group work could involve coming up to the ActivPanel at the front of class to take part in an activity and work as a team, or students can work in teams on handheld devices, and then share their results with the rest of the class through screen mirroring. By working collaboratively, it’s also teaching students valuable life skills that they will need as they progress through school to the world of work. Can AI help to address the literary skills gap? Sponsored: Rory Dixon, Year 3 Teacher at All Saints HwB Primary School, discusses the benefits of using edtech to aid SEN pupils. Sponsored: Presenting in front of classmates is increasingly becoming more of a norm than an exception? How can the schools of 2017/18 be using technology to help improve teaching and learning?